Whirlwind weekend! Friday, I got home from work and went through my normal routine; laundry, cleaning and Netflix. Last week was packed with client visits and afterwork plans. I didn't have mych time to myself and was really looking forward to chilling. I roasted salmon, broccoli and heated up half of a baked sweet potatoe for dinner. I dipped everything into my secret sauce; Tessmae's Avocado Ranch and Sriracha. Saturday, I signed up for a Barre class at Body Alive, Kenwood. Class wasn't until 9:30 a.m., so I had some time to ease into the day. I started with my Five Minute Journal, jotting down what I am grateful for, my goals for the day and affirmation. I love weekends where I can sleep in a bit and take my time waking up. After journaling, I made coffee and snacked on a couple of rice cakes with Sunflower Butter and jam as I worked on the blog. I stirred in a sample of Vital Proteins Marine Collagen into my coffee. I love collagen for it's extra boost of protein and the added gut health benefits. It's the perfect addition to coffee, as it quickly dissolves in hot liquid. I usually add coconut oil and a splash of unsweeted coconut milk to give it some staying power. I finished my coffee and headed to Body Alive. It's a local studio that has hot yoga, barre, cycle and HIIT classes. I bought a Groupon for two months of unlimited classes awhile back and have been going to one a two a week for the past month. I love that the pass allows me to select classes that align to my schedule and body's desires. This time, I picked Barre because it's new to me and I heard it was low impact. If I'm being honest, I wasn't sure what to expect. I traded my ballet shoes for soccer cleats in first grade. I little concerned that I wouldn't be able to do many of the exercises. Barre classes are a combination of ballet postures, yoga and Pilates and are designed for dancers. The instructor started the class by get us into a dancer posture, standing tall and walking light. We warmed up by marching in place and going through a series of lunges and kicks. Even though I am not light or nimble, I did really enjoy the class. The instructor took time to demonstrate each move before the set began, which I really appericated. Though I didn't leave class sweaty, I did felt satisited with my workout. It was low impact and fun to try something new. I will definetly be back! Saturdays are for second breakfasts. After class, I whipped up a quick breakfast of roasted sweet potatoes, Trader Joe's Chicken Maple Sauage links, avocado and a fried egg. Saturday's theme was self care. I ate breakfast, cleaned up my apartment and decided to take a bubble bath. I add epsom salt and heavy pour of Bath and Body Works 'Stress Relief'. The combination of magnesium and essential oils was exactly what I needed after a long week. I felt the tension fall away the longer I soaked. After a long bath, I was relaxed and ready to focus. I sat down to work on a WHN client folder and plan content for this month. I was feeling really productive, after working for a couple of hours. I treated myself to a little walk, to get some fresh air and refocus my energy. I got home and made a quick snack; Kitehill Plain yogurt, Purely Elizabeth Cranberry Pecan Granola and fresh berries. I've really been digging the yogurt-granola combo these days. It's creamy with a satisifying crunch. The berries create an even more complex texture that I love. I savored every bite and got back to work, finishing up some research and putting my work away for the day. I had a few errands to run, getting things to prepare for an early morning drive to Nashville on Sunday. I stopped at the liquior store to buy a gift and Target for hand warmers. I got home and packed and settled down on the couch to watch a couple of episodes of the 'The Office.' Andrew called, we talked through plans for the morning and I made a quick dinner before heading to bed. I call this fake Chipotle. 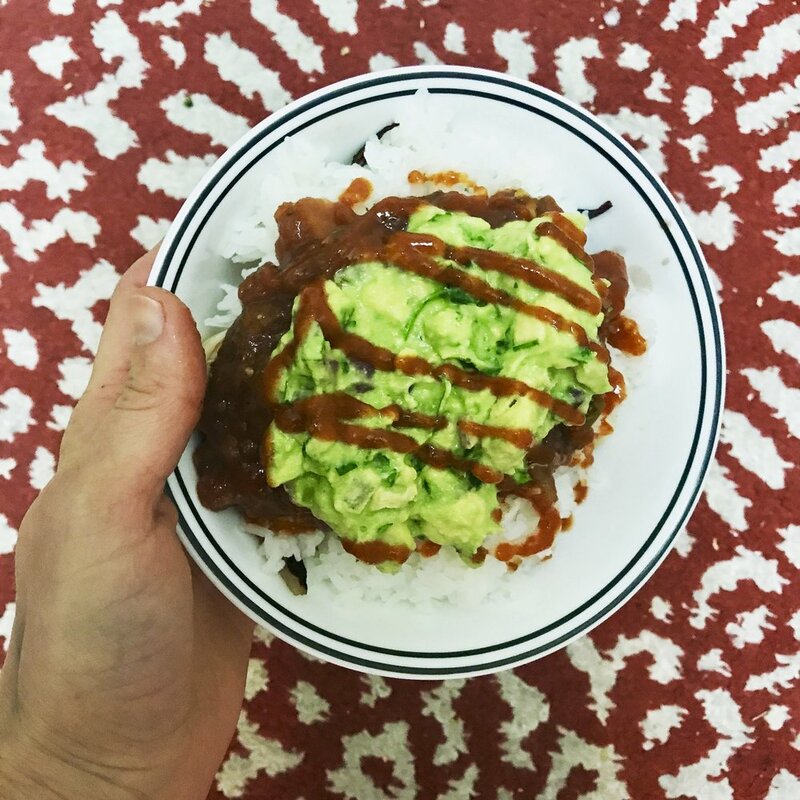 It's been on repeat all week; rotisserie chicken, Trader Joe's Jasmine rice, organic black beans cooked in Apple Cider Vinegar, sauteed red pepper and onion, salsa and homemade guac. Drenched in Sriracha and scooped up with tortilla chips. Sunday, was a crazy-fin day. I woke up at 4:30 a.m., to get ready for a 24 hour trip to Nashville, TN. It's a four hour drive from Cincinnati, so we drove straight through. We made it in record time, thanks to Andrew's driving and light traffic. We headed straight to the Air Bnb, where our crew was staying. We were there to surprise Tim, who was celebrating his 30th birthday. He's one of Andrew's good friends and had no idea we were coming. It was fun to sneak inside and wake him singing 'Happy Birthday'. The had a night on the town and were a little slow to start, so we brought our stuff inside and poured a drink while the group got ready. Around 9:30 a.m., we hopped in an Uber and headed to the Red Door Saloon for brunch. After a hectic morning with nothing to eat, I was ready for breakfast. I ordered the basics; eggs, bacon, hash browns and avocado. The chef was generous and gave me an extra egg and piece of bacon. I ate every bite. Once I had a good base, I ordered a Moscow mule. I sipped on that as the group finished their meals and took photos. We grabbed our checks and walked to the stadium. We got the stadium and quickly found our seats. The game started by the time we got there, so we grabbed drinks and headed up. 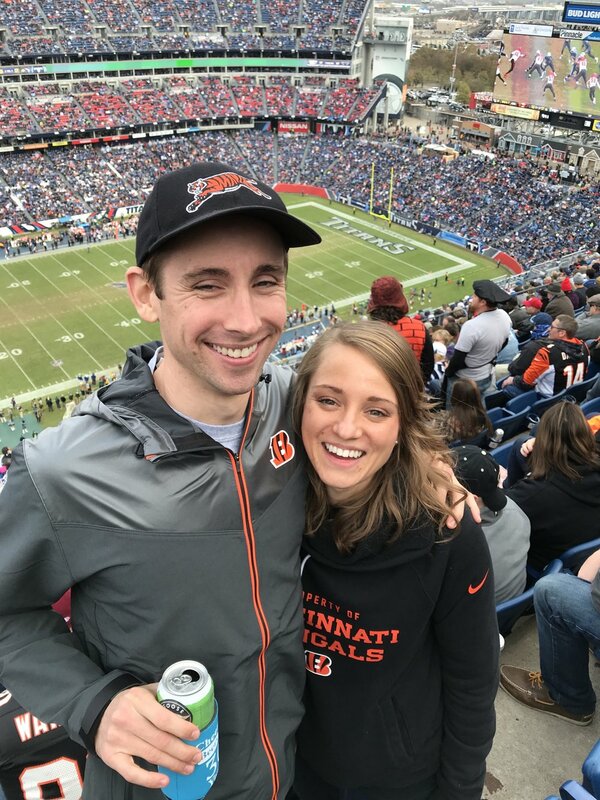 We were sitting a section filled with Bengals fan, which was a lot of fun. Though it was a tough game, we had a great time drinking and cheering with friends. After the game, we headed back to our Air Bnb to freshen up. We had a few drinks and snacks while we got ready. A couple of hours passed and I was ready for real food. Andrew and I called an Uber and headed downtown to find some food. We ended up at Pancho and Lefty's Cantina, a taco place with live music and delicious food. We ordered chips, guac and tacos. and OMGEE, the chicken adobo taco was to die for. Literally the best. The meat was seasoned to perfection, spicy and sweet and topped with avocado cream sauce and verde salsa. I could not stop talking about it. I wish I had two. We finished our food and headed next door to meet up with our friends. They ordered BBQ at Rippy's. They stayed out to party but we were pretty whipped, so Andrew and I headed back to the condo and got ready for bed. I'm so glad were able to make it Nashville, even if it was less than 24 hours! We had such a great time. Nothing beats qualtity time with friends!